This is a simple introduction to HTML. 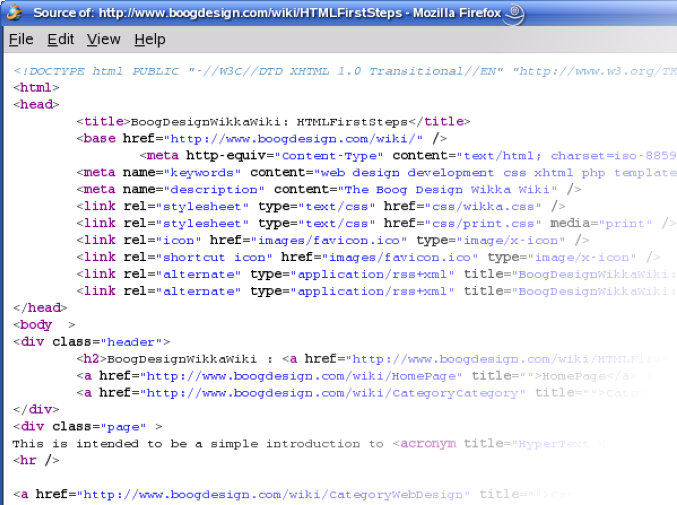 After reading this tutorial you should be able to construct a simple web page. You'll see a lot of angled brackets (less than and greater than), these delimit 'tags' - so a tag is a less than bracket, followed by some text and then a greater than bracket, and the tags describe the structure of the HTML document. You need tags to describe elements, and elements make up the structure of your HTML document - they describe your document to the web browser. You can describe headings and paragraphs and links and the web browser can then display your HTML appropriately (you will here this referred to as 'rendering' - the browser renders your HTML). The difference is a subtle distinction in the type of HTML document, for now you don't need to worry about it as long as you are consistent throughout your page - if the document already has single tag elements of the first type continue to use the same ones. How do elements fit together? My browser displays things just fine with the wrong examples above, why should I bother? If you don't put the closing tags in, the browser will guess where to put them, and sometimes this will not be where you expect them to go. Copy the text above and paste it into a text editor, save it to your desktop as hello.html (if you're using Notepad in Windows, make sure you change the drop down selector to say 'All Documents' when you're saving, otherwise the document will be saved as hello.html.txt which won't work, if you're having trouble try turning on file extensions). You should now be able to double click on the file to have it open up in a web browser. Currently your document is using the default browser styles so it looks a little bland, if you want to smarten it up a bit go to the introductory CSS tutorial. If you'd rather learn about more complex elements, adding lists, links and pictures to your page, got to the beginners HTML tutorial.